Here is Why Drinking Water That is Rich in Hydrogen May Be One of the Most Important of All Health Habits. Generally speaking — you will live longer and have better health! Functionally — you’ll be better hydrated, have softer skin, have less inflammation, less DNA degradation, you’ll think more clearly and not get as easily tired. Maintaining ample active hydrogen levels in one's body is one of the greatest keys for preserving health, vitality and longevity... for up to decades longer. Most people's bodies almost completely lack Hydrogen molecules and free atoms, meaning their bodies lack hydrogen molecules and atoms that are unbound to other elements. The reason that our bodies lack Active Hydrogen is that hydrogen is rarely found in a chemically unbound condition in plants, rocks, atmosphere or in naturally occurring water for the simple reason that Hydrogen is so light and always escapes into the atmosphere and then into space. Even though, hydrogen is part of the water molecule, it is always bound to oxygen, except in rare locations where water bubbles up through magnesium rock... and, in this case, some of the water touching the magnesium rock is disassociated into hydrogen and oxygen. Once disassociated the hydrogen quickly bubbles out of the water, and people bathing in the water do breathe some of that or they can put some of the hydrogen-containing water into capped bottles and take that water home with them to drink. In that way, they can get some of the hydrogen into their bodies and are benefited thereby. The takeaway is to remember that hydrogen has to be unbound in order for it to benefit one’s health. Getting more active or unbound hydrogen into our bodies, which is called “Hydrogen Therapy”, is one of the most beneficial health practices you can have. Hydrogen therapy has reached the awareness of eminent scientists. It is real and actionable NOW, and you should do it, if you have any desire for optimum quality of life or even just a self-preservation instinct. Below we list what emerging science and anecdotal reports say that hydrogen enriched water does for human health. Which of these hydrogen benefits are you interested in? Improves hydration levels (significantly better than tap water). Helps women have easier pregnancies and healthier babies. What are Hydrogen’s Mechanisms of Action For Improving Health? Hydrogen helps stop or lessen oxidation by quenching or neutralizing (technically, this is called reducing) oxidants (free radicals) in the body to a much greater degree than can be accomplished by eating anti-oxidant rich foods. Hydrogen atoms are the tiniest of all antioxidants. They help to reduce damage from free radicals in all parts of the body (because they are so small that they can go everywhere). By reducing free radical damage they help reduce inflammatory, aging and chronic disease processes that would otherwise continue to occur. According to one scientific study, drinking hydrogen rich water (1.5 liters daily of 1.5 ppm hydrogen richer water) for eight weeks resulted in a 39% increase in the antioxidant enzyme super oxide dismutase (SOD) and a 43% decrease in thiobarbituric acid reactive substances (TBARS) in urine (TBARS are a measure of the oxidized and damaged fats in your body). Additionally, an 8% increase in high density lipoprotein (HDL)-cholesterol and a 13% decrease in total cholesterol/HDL-cholesterol was observed from baseline to week 4. In other words, drinking hydrogen rich water is extremely anti-oxidizing. This same benefit would result from taking 1 Hydrogen Rejuvenation tablet daily. 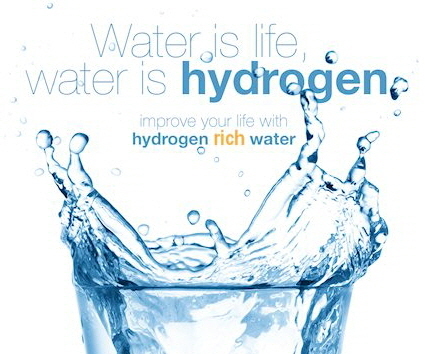 Hydrogen enriched water helps increase the amount of water in ones cells and tissues. The way this works is that ACTIVE hydrogen changes the electrical charges in water which causes water molecules to form smaller groups and allows for easier hydration (movement of water into cells through aquaporins, IE, water channels (cellular plumbing discovered in 2003)... and transport of vitamins and minerals. This is one of the reasons for health benefits from utilizing hydrogen rich water. Better hydrated people recover faster from illness and have a reduced mortality. 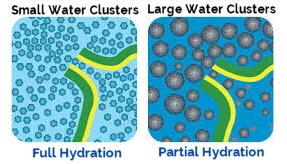 Sadly, while babies are 75% to 85% water, adults are often less than 50% water because the older we get the less ability our bodies have to convert large clusters of water into smaller clusters of water and single file aligned water that can easily enter cellular aquaporins in order to enter cells. Third, hydrogen atoms are used in the mitochondria, in the presence of oxygen, to create efficient energy. Hydrogen, literally, can fuel the ATP engine that powers every cell in the body. More fuel means more work can be done, less food needs to be eaten, and less food further reduces the oxidative load the body has to deal with. Having Hydrogen rich water literally means your mitochondria energy production can be higher, giving “greater energy and living capacity” for everything your body does. 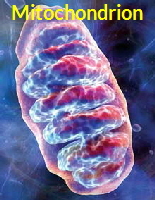 Active hydrogen increases energy output in mitochondria by directly supplying the best “fuel” in the universe, hydrogen. Active hydrogen quenches free radicals, helping curtail free radical damage (aging) to the human cells. Active hydrogen, reduces water cluster size, which enables more water to get into cells, which increases cell hydration... back up towards the 75% where human hydration should be... for optimum health... and for beauty... having less wrinkles and softer skin on the outside... and better function of cells and organs on the inside. According to Dr. Sanetaka Shirahata (Graduate School of Genetic Resources Technology, Kyushu University), the so called miracle healing water all contains Active Hydrogen (atomic hydrogen) and Hydrogen (molecular hydrogen) in water and the healing effect is simply the result of the health benefits of that Hydrogen. On the 9th of November 2002, Japan’s TBS TV program name USO, televised the story about this healing water from France and how 5 million visitors a year come to get some of this healing water and about the more than 3,670 cases of healing confirmed by doctors. The TV show discussed how the Lourdes miracle water was brought to Japan Kyushu University where it was analyzed by Dr. Sanetaka Shirahata and found to be rich in ACTIVE HYDROGEN. More than 8 million visitors a hear go to get some of this healing water 200 miles away from Mexico City, with numerous medical confirmations of the beneficial results, including Magic Johnson. A TV program was also broadcast about this water in 2000. Analysis showed that it was also rich in ACTIVE HYDROGEN. One of the longest-lived race of people in the world are called the Hunza. These people, located in the northern Pakistan, are found in several high-altitude mountain valleys. Many Hunza claim to be 150 years old; many others are documented centenarians (over age one hundred). For many years, scientists have pondered the mystery of what makes them so healthy, for they rarely suffer the diseases the rest of us know so well. Some researchers are beginning to believe that the Hunza miracle derives from the water that they drink. The mountain water that flows into the Hunza villages comes from the surrounding glaciers. This water is filled with mineral solutes, and it tests out to have the highest amount of dissolved ACTIVE HYDROGEN yet discovered. In November 1995 I presented a hypothesis known by the title: “Water: Regulating Theory (Hayashi's Model)” in a US health magazine. It says that active oxygen could be scavenged or reduced by atomic hydrogen, which results in production of H2O to give again a birthplace for every life form. “My hypothesis was born from the clinical observation study in our clinic. Since May 1985 we have confirmed thousands of clinical improvements, obtained solely by exchanging drinking (as well as cooking water) from tap water to reduced water (hydrogen rich water). Those improvements were very exciting and some of them were considered to be miraculous at that time, when Shirahata's paper was not yet submitted. It should be remembered that such putrefied metabolites are the same ones which are produced as a result of putrefaction of protein. The difference lies only in the fact that the former putrefaction process is brought about by intestinal microbes, whereas the latter is brought about by airborne microbes. Based on these facts, I proposed a hypothesis Pre-and post hepatic Organ Theory in 1988, 1989 & 1990 at the International Symposium on Man and His Environment in Health and Disease' held at Dallas, Texas, USA. I stated that, as it is impossible to purify the polluted water in the St. Laurence River without purifying the polluted water in Lake Ontario, so it should be impossible to improve the disorders of post hepatic organs, without trying to improve the disorder of pre-hepatic organs, namely putrefaction in gastrointestinal tract. Such clinical experiences have led us to recognize that reduced water is not only" effective for restoration of intestinal flora metabolism, but also could be effective in scavenging active oxygen. Our clinical observation" data, and my hypothesis, were delivered to Prof. Shirahata in April 1996 and his research has since started. 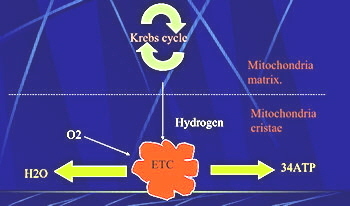 Shirahata's paper means that cell metabolism, either microbial or cancerous, depends on its intracellular water, namely cell metabolism. This can vary according to the property of intracellular water, i.e. hydrogen-rich or not. And even cancer cells might lose their characteristic feature of unlimited proliferation when they are immersed in hydrogen-rich water, originated and developed in Japan, but totally unknown in the past throughout the world. The solution might now be in our hands. Our 'new water' should be the first choice for all of us to take, as has been suggested by Happe, Shirahata and ourselves. Devices to produce reduced water were introduced into our clinic in May 1985. Soon after, the Hydrogen Producing Mineral Stick was designed to make hydrogen-rich water available inexpensively and more efficiently to all. This Hydrogen Producing Mineral Stick showed to be a more effective source of hydrogen than electrolyzed-reduced water with no concern of hydrogen gas dissipating within minutes after being poured. This then allowed even better results to follow. Based on the clinical experiences obtained in the past 15 years, it can be said that introduction of naturally reduced water (using H-01 Active Hydrogen Generator; later named The Hydrogen Producing Mineral Stick), or electrolyzed-reduced water for drinking and cooking purpose for in-patients should be the very prerequisite in our daily medical practices. It is because any dietary recipe cannot be a scientific one if property of water taken by the patients is not taken into consideration. © All rights reserved. 2017 to 2018. If you have a health condition, please consult a medical professional in regard to your existing health problems. None of the statements in this website have been reviewed by the FDA. No products mentioned herein have the purpose of diagnosing, treating, mitigating or alleviating any disease condition. We offer no warranty of benefit nor guarantee against harm. Nutrition and lifestyle should never be utilized in lieu of consultation with medical professionals. Anecdotes related herein have not been vetted and results may have been due to additional factors not disclosed. Anyone who relies on this website information in lieu of consultation with a health professional does so at potentially grave risk. Scientific data (that may be mentioned on this site) is always changing. Also, there are dangers inherent in virtually any health condition that need to be evaluated by your health care professional who prescribes according to your unique situation. The biggest danger in self-prescribing is the delay that may result in getting the most effective treatment for your unique body and particular situation. Only your licensed healthcare provider is permitted by law to recommend a course of action for your health according to your uniqueness and the serious of your health need. Be advised. Be smart - and seek licensed medical help when needed.